When Japan built its 60-foot life-sized statue of the titular giant robot from groundbreaking anime Mobile Suit Gundam back in 2009, everyone generally agreed that yeah, this thing was pretty goddamn sweet. Then, the Japanese took it down, put it back up again, and finally took it down for good shortly after the devastating Sendai earthquake and tsunami in March. (And that's not even getting into the saga of the Chinese knockoff version). With the full-scale Gundam statue now gone, the town of Mibu in Tochigi Prefecture - sometimes known as Japan's "Toy Town" for its plastic model factories - wants to fill the nation's giant robot void with yet another statue of a mecha from the famous Mobile Suit Gundam anime. This time, though, they're paying tribute to the bad guy. 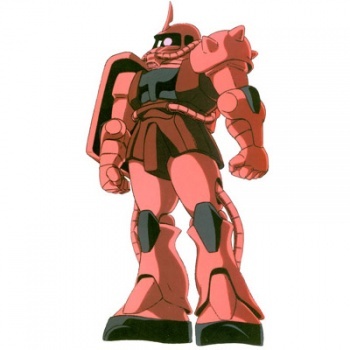 A volunteer group formed from Mibu locals has started raising money to build a life-sized version of the iconic red MS-06 Zaku II piloted by Mobile Suit Gundam's chief antagonist and rival, Char Aznable. The idea was first raised back in December at a town meeting, but plans were only formalized last month when members of the team consulted with the copyright holders at Bandai and determined that the construction would cost several billion yen (tens of millions in USD) to complete. The group is taking donations over the internet to help get things started. "There are Gundam fans all over the world," said Hiroshi Takayama, one of the group's founders. "We want to call (for cooperation to build the statue) throughout the world with Twitter and Facebook." Members will also be selling beverages - colored Char red, naturally - at earthquake fundraising events to help fill the coffers. If this sounds like a pie-in-the-sky dream scenario that could never happen to you, Mibu actually has some precedence here. The town is already home to the Bandai Museum, which features a 1:1 scale Gundam bust (albeit one lying down on the ground), so it might be able to wrangle some support from the noted toymaker. It wouldn't be the only town to build its own giant robot, either - the city of Kobe built a life-sized version of Tetsujin 28-go (aka Gigantor) back in 2009. If the town of Mibu can in fact build its giant Zaku II, then clearly Japan will have to rebuild the life-sized Gundam. Then the two of them can fight and pave the way for humanity's ascension into space colonies and interplanetary warfare.